Apple has reportedly fired an engineer who worked on iPhone X after his daughter posted a hands-on video of the device to YouTube, breaking the company's non-disclosure agreement policies. 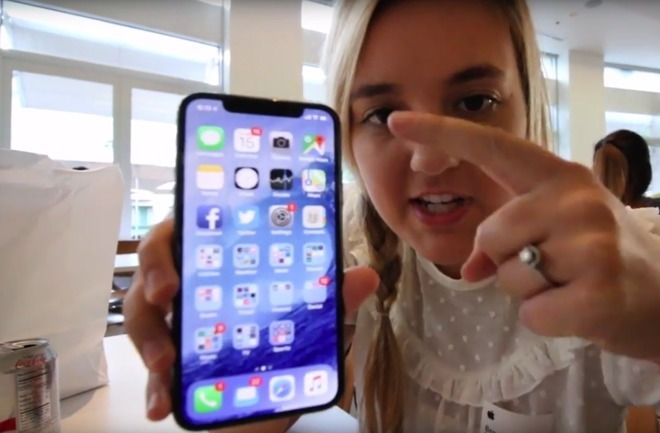 Last week, Brooke Amelia Peterson posted a short hands-on video of Apple's hotly anticipated smartphone to her YouTube channel, showing off Apple Pay and a few iPhone X exclusive user interface features. Thanks to hype leading up to the phone's release, the "in the wild" clip shot in the Caffe Macs restaurant on Apple's campus, quickly garnered media attention. Apple subsequently called for its removal, a request with which Peterson complied, but not before the footage went viral. In a post to her YouTube channel on Saturday, Peterson claims Apple was forced to fire her father over the incident. Company rules strictly prohibit the documenting of unreleased hardware, whether it be photos, video or descriptions of device features. Unauthorized filming on Apple property is also verboten. "Apple let him go," Peterson said. "At the end of the day, when you work for Apple, it doesn't matter how good of a person you are, if you break a rule they just have no tolerance." Apple's strict NDA policy is in place not only to ensure the security of proprietary technology, but also for employee safety. The device in question was an internal development unit that carried sensitive information like employee QR codes, product codenames and internal software, including a Text Edit app. According to The Verge, the elder Peterson worked on iPhone RF and wireless circuit design prior to his dismissal. Prior reports claim the engineer was scheduled to make the move to Apple's new Apple Park campus in December. Peterson said her father takes full responsibility for the turn of events, adding that her family holds no animosity toward the company.